I agree with Bree. I wouldn't have expected anyone to use an entire fish, I expected little things like shri...prawn and things like that, you're brave, girl! I wouldn't have used fish, that's gross haha. Anyway, normally your expressions are strong and yeah you look androgynous, but this week it's so soft. I don't think you look androgynous at all, you just look like a very vulnerable girl. Your expression, the hair, the makeup, everything's lovely. Great job! I know you probably had some trouble with this being a vegetarian and all, but I liked that you, all of you guys, sucked it up and just did it. Now, I've never been a fan of profile shots, and this time it's no exception. It's a beauty shot, and I know it doesn't have to be this way, but I think it would have made much more of an impact if you had looked at the camera. The expression isn't bad, but it's not that great because we can't really see it. Now, the makeup, the way your shoulder's raised, and the accessories(necklaces things), all make this look very feminine. You're not a feminine guy so don't try going for that. Go for something strong and masculine, since it fits you better. now, we haven't seen killian's yet, but i want these two crazy kids on the top. is that karasu's best picture? it's so...feminine. i'd say chantal's first one, cuz then we'd have variation and you can see her eyes better. 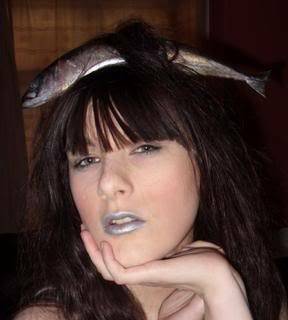 Chantal: I gotta give you props for putting that fish in your hair. I don't think I could do that. You look fierce, the hand is very graceful, and it's an obvious beauty shot. Good work this week! If I had to give one critique I'd say your eyes are a little bit too squinty, but otherwise well done. Karasu: For a beauty shot, I don't think this works because your eyes are too far away from the camera. Profile is not your best angle, but I commend you for trying something different. I can definitely see what you were trying to do with your look, and I really do like the shrimp and the shells and your spiky hair, but overall it fell a little short of expectations I'm afraid. Killian: I don't understand why this is so washed out, I think you tried to Photoshop it and didn't do it right. You've lost all contrast. But yay it's not blurry! I'm a little confused at the look in your eyes, this is supposed to be a beauty shot but you look...sarcastic? I wish you would've chosen a more dramatic representation of fish, or used it as more of a costume. Much better than usual though! I WOULD say the second one, but given how nice the expression is in the first one I'd say go for it. Looks like the first one is getting chosen for her so I'm gonna go ahead and do it. First of all, I want to commend you for not only getting over your fear momentarily but also doing all-out, using a real, icky disgusting fish in your beautiful HAIR! Secondly, this picture is magic. You look like a beautiful sea creature. The blue lipstick makes a triumphant return! Last week I said you had to watch your angles because your face can go from strong and slightly androgynous to drag very easily, so this week is actually really good - you're beautiful with JUST the right amount of androgyny, without being a man in drag. You're getting REALLY good at taking criticism and making it work. While this is a wonderful picture which shows how modelesque you are, I don't feel like it's unique. I feel like we've seen this before - and from you. Chantal takes risks with things and sometimes they don't always work, but I get the feeling that you play it safe a bit too much. Nonetheless it's a really powerful expression, but it doesn't read "fierce sea creature," it reads "Model 101." Oh WOW. I wasn't expecting you to do well on this, but this actually is a wonderful beauty shot which makes a GREAT addition to your portfolio - definitely your best shot to date. 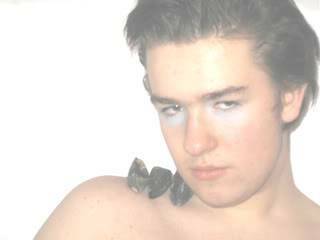 The expression is soft but it still has a great deal of power behind it, you look etherial, and your neck looks great. There are a few problems - for one, you didn't really use the fish to their greatest potential. For another, your eyelids are a little uneven. However, I'm still shocked at how nice this is - especially the QUALITY of the photo. No more blurries! You should be proud because this photo proves that you deserved to make it this far. They're all great - Killian's was GREAT for him. Still not as good as the other two, but MAN. Talk about saving it for the eleventh hour. The F3 shots are WAYYYYY better than last cycle. Chantal looks like the REAL Chantal in that first picture! I think its the hair. Chantal- Chantal I have been a fan of yours since your car shot. I think this photo proves your modeling capabilities and shows the judges how diverse your are with your poses and such. I love what you did with the fish and how you overcame your fear, congratulations you deserve that Final 2 spot!!! Karasu- Same damn freakin facial expression only to the SIDE this time. Its interesting I like what you did with the fish, its just its the same pose every single week. I may be the only one who is picking up on this but I cant stand that almost every shot in your portfolio looks the same just with different clothes, makeup, etc. You are no doubt in the Final 2, just I wouldn't feel so comfortable if I were you. Killian- Killian, Killian, Killian. Its the end of the line, you did the best you could and I personally think this is your best shot of the entire competition. Unfortunately I don't think its on the same level as Chantal's or even Karasu this week. I agree, his same-facial-expression schtic is getting annoying. But at least that one facial expression is better than Killian's half-asleep thing he has giong on.